Some of my favorite (non-Blogger) blogs display a "sideblog" in their layout in which to display news snippets and links to interesting sites. These sideblog entries (often called "asides" or "link blogs") are much shorter than a regular blog post, and do not appear in the regular posts section. While it would be simple to create a sideblog using a links list widget, Twitter, or by adding a Del.icio.us RSS feed to the sidebar, such methods would not allow readers to leave comments on our blogs about these entries. To allow commentary for sideblog entries, they need to be regular blog posts in a category whose posts are filtered from the front page. 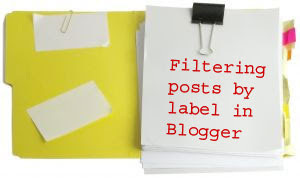 In this post, I'll explain how you can filter posts of a particular label from being displayed on your blog's homepage then use this label's feed to display your sideblog. Step 1: Back-up your template! Before making any changes to your Blogger template, it is always good practice to make a back-up of your existing template. It is especially important for this Blogger hack: we will be filtering which posts display on the homepage, and any errors could result in no posts being displayed at all! To back up your Blogger template, go to Layout>Edit HTML in your Blogger dashboard, and click the "Download full template" link near the top of the page. You will then be prompted to save your template as a file to your computer hard drive which you could use to restore your template (if you make a mistake) or revert back if you change your mind about using this hack. First, go to Layout>Edit HTML in your Blogger dashboard, and ensure you have checked the "Expand widget templates" box. 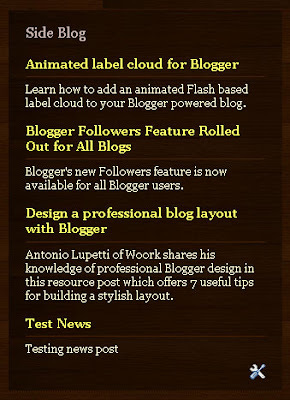 The code which we need to edit is located within the "Blog Posts" widget. In your own template, this code may not contain the <data:adStart/> and <data:adEnd/> tags, though this should not affect the overall functionality of this customization. If you struggle to locate this section of code, use your browser's search function to locate the following phrase: hfeed which should be present no matter which template you are using. Be sure to highlight all of the code and replace with the section above in its' entirety! Otherwise, when you attempt to preview or save this code, you will receive errors saying that tags are not closed properly. In the code above, you will notice I have highlighted "Sideblog" in bold red. This is the name of the label which we will be filtering from the display of posts on the home page. You can change this to any label name you prefer. This is case sensitive, so be sure to use the same case in the code as the label you will use to tag your posts (ie: "Sideblog" is not the same as "sideblog"). Once you have edited this section of code, attempt to preview your template. If any of your recent posts have already been tagged with the "Sideblog" label, you will now notice they are missing from the output of posts. Provided there are no errors visible when you preview your template, you can now save your edited template. Now we have filtered "Sideblog" posts from the list of recent posts on the home page, we need to add a widget to display sideblog posts in the sidebar. To achieve this, we will use the sideblog label feed. Where "LabelName" is the name of the particular label you wish to use. This URL structure also works for custom domains. Simply replace "yourblog.blogspot.com" with the main URL for your blog. To do this, go to Feedburner.com and add the URL of your label feed. Then go to Publicize>BuzzBoost in the dashboard for this new feed. If you prefer not to use Feedburner, it is possible to display your sideblog using a regular feed widget. However, this will require more editing of your blog's HTML code (as Feed widgets will only display the post titles by default). Go to Layout>edit HTML in your blog dashboard. Do not check the "Expand widget templates" box. Depending on your template, the code may not appear using the exact same phrases. If you are at all confused, search for a familiar widget title instead. Now preview your template. If you have followed the steps correctly, you will receive no errors when you preview your template and should proceed to save. If you do receive errors, click the "Clear edits" button and begin again, being careful to paste the code after the <b:section> line. Once you have saved, go to Layout>Page Elements in your Blogger dashboard. Click on the edit link for the new feed widget you have added. In the "Feed URL" section, add the URL for your "Sideblog" label feed (see instructions above to locate this URL). In the preview, you will see each item title appear in a bulleted list. This is fine and perfectly normal. Save the feed widget here. Now when you take a look at your blog, you will see your "Sideblog" feed displays post titles and a short summary of each sideblog entry in the sidebar. Once you have added your widget and configured the feed URL, you should be able to move the location of your sideblog through the "Page Elements" section of your dashboard. In order to use your newly added sideblog effectively, there are a couple of things which you ought to be aware of. I'll explain all of these "caveats" to ensure you can make use your sideblog to the full potential. Sideblog entries should only be labeled with the "Sideblog" label! When writing a sideblog post, be sure you only add the "Sideblog" label (or the name you chose when adding this function to your template). This label will be case sensitive, so "sideblog" and "Sideblog" will appear as two different labels. If you do add more than one label to your sideblog posts, these posts will also appear in the main posts column, alongside your regular blog posts. This one may be a little more tricky. You can use images in your sideblog posts. However, you should ensure they are no wider than your sidebar (or the widget area they are contained in). Wherever possible, ensure you use the "small" size option for your image when uploading. Try also to ensure your image is centered above the text, as left or right aligned images may cause layout problems, especially when displayed in the sidebar/other narrow widget area. When you display an image in your sideblog posts, the HTML code for the image is counted towards the text count of the summary, thus shortening the amount of text which will be displayed. If you prefer to display more text, be sure to place images at the bottom of your posts so these will only be displayed on item pages (not in your sidebar). In this tutorial, I have explained one possible use for the filtering of posts by label: how to create a sideblog. Only one category of post to be displayed on the home page (the rest organized by label and accessible through sidebar links). I hope you have enjoyed reading about filtering posts by label in this tutorial, and now have the knowledge required to add asides in your own Blogger template. Please let me know your thoughts and opinions by leaving a comment below.